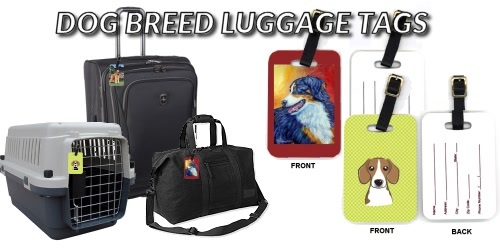 Luggage Tags with Dog Breed Artwork – complete with leather straps. These double sided Luggage Tags are made from fiberglass reinforced plastic. The front of the Luggage Tag features a dog breed image and the back of the Luggage Tag features a form to list your personal information. Travel in Style or use these Tags for identifying crates, cases, etc.